One evening an old priest told about a battle that goes on inside people. 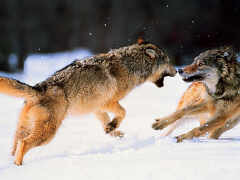 He said, "My son, the battle is between two 'wolves' inside us all. One is Evil. It is lust, anger, envy, jealousy, sorrow, regret, greed, arrogance, self-pity, guilt, resentment, inferiority, lies, false pride, superiority, and ego. The man thought about it for a minute and then asked: "Which wolf wins?" The old priest simply replied, "The one you feed." Excellent answer !! The one you feed !! Yes to know God is to Love Him. How can we not love the Lord more deeply as we ponder at how vast His love is for us. Little unimportant me. I just listen to the CD “Gaze Upon the Lord” by Inez and in the 3rd. song, “Love All Love’s Surpassing” there is a line that says, “Grant me true surrender (Lord), make my heart Your throne”. That one line makes me stop in my tracks and ponder over the idea of all of us truly surrendering to God. Then Him making my heart His Throne !!! What an awesome idea, one that truly can take your breath away. I first heard this 2 years ago at an annual retreat I make at the Jesuit Retreat House, Lake Demontreville, Lake Elmo, MN. Thank you for the reminder.